Professor Jake Rowan, D.O. 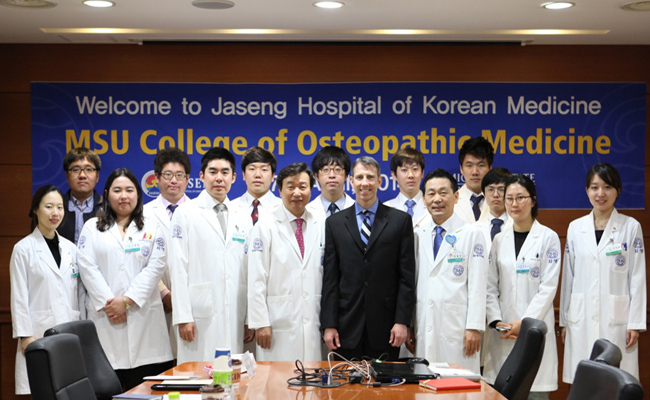 from Michigan State University College of Osteopathic Medicine (MSUCOM) visited Jaseng Hospital of Korean Medicine on April 7. Professor Rowan had been invited to Korea by Korean Society of Chuna Manual Medicine for Spine & Nerves to give the lecture, ‘An Osteopathic Approach To Low Back Pain' on April 6. As a disciple of the late Dr. Philip Greenman, a pioneer of Osteopathic Medicine, Professor Rowan had grabbed the attention those in attendance with detailed and insightful lecture on Osteopathic Medicine. The following day of his lecture, he had visit Jaseng for the facility tour and to observe non-invasive Korean medicine practice. He had praised the facilities and physicians at Jaseng and showed a keen interest in Jaseng treatment methods such as Motion Style Acupuncture Treatment(MSAT) and Chuna manual manipulation. He was introduced to the safety and effectiveness of acupuncture treatment for spine and joints conditions and had a chance to observe an acupuncture treatment session for a patient with shoulder pain. He had chance to visit Jaseng’s herbal medicine and pharmacoacupuncture processing and packaging facility to observe the start to finish process of herbal medicine and pharmacoacupuncture. He had praised the level of quality control on automated process and had many questions for each stage of herbal medication processing.